Climate change affects every single one of us, no exceptions. Whether you live in a suburban estate in the UK, a slum in Cape Town, or a village in the Himalayas climate change will affect you in different ways. That could be the things you enjoy like sport or being out surrounded by nature or the food we eat and places we live. It really is a world wide problem and one none of us can ignore. We can’t afford to turn a blind eye to climate change any more, we’re heading to complete destruction of our planet due to problems like climate change. Fortunately though it’s not too late and there is a possibility that we can start to reverse this ongoing. Above I’ve spoke about how it affects everyone but what actually is it? Climate change is a large-scale, long-term shift in the planet’s weather patterns or average temperatures. Due to this climate patterns change it means more extreme and unpredictable weather across the world. Since the last ice age, which ended about 11,000 years ago, Earth’s climate has been relatively stable at about 14 °C. However, in recent years, the average temperature has been increasing. Seven main sources of evidence for climate change include the rising of temperature, changes of rainfall, changes in nature, rising sea levels, retreating glaciers, decline of sea ice and the shrinking of ice sheets. In the past century the planet has warmed by an average of nearly 1°C. This may not sound a lot but on a global scale this is a huge increase and it’s creating big problems for both people and wildlife. There are many causes of climate change. Some are things we all do and some are things which happen on a world wide scale. First of all, burning fossil fuels. Burning any carbon based fuel converts carbon to carbon dioxide. Unless it is captured and stored, this carbon dioxide is released to the atmosphere. Burning fossil fuels releases carbon that was removed from the atmosphere millions of years ago by animals and plants. Another example of a cause of climate change is the breeding of cattle and deforestation. Industrialised nations have been breeding vast numbers of methane producing life stock and cutting down the forests that naturally absorb carbon dioxide from the air. The trapped carbon dioxide results in trapping more of the suns heat. By doing this it is raising the global temperature. The speed of this change has happened faster then any natural process therefore faster then any natural system can adapt. Years ago, before any type of modern human activity, carbon dioxide was in the atmosphere. Some people may say why wasn’t climate change happening then? This is because we’ve produced more greenhouse gases over the past century and at the same time we’ve been destroying things, like forests, which would naturally take the carbon dioxide out of the atmosphere. Due to this offset of balance CO2 levels are rising. Why is Carbon Dioxide a problem? Carbon dioxide is one of a number of gases that are transparent to the visible light falling on the Earth from the Sun but it absorbs heat emitted by the warm surface of the Earth. During geological history of the Earth the level of carbon dioxide in the atmosphere has varied considerably and this has had an impact on the global temperature. All of the global ecosystems and species have adapted to a lower level of atmospheric carbon dioxide and critically, human civilisation has also grown since that period. Since the industrial revolution humans have been burning sequestered carbon dioxide in the form of coal, oil and natural gas which has the result of releasing energy but also carbon dioxide into the atmosphere. Other greenhouse gases include methane, nitrous oxide and water vapour. As I mentioned before, climate change affects everyone so it has a lot of impacts. It impacts humans as well as animals. The climate plays a major part in our planet’s environmental system, even minor changes have impacts that are large and complex. Climate change isn’t something that’s recently been discovered or something that’s happened over night, scientists were first alerted about the dangers of it 30 years ago. It isn’t something that’s cheap either, the insurance industries estimate the impact of global warming is costing hundreds of billions of pounds each year. Water – As you will know lakes and rivers supply drinking water for people and animals. As well as this it’s vital for agriculture and industry. Our oceans and seas provide food and supplies for billions of people. Unfortunately climate change is and will have more mayor and unpredictable affects on the worlds water systems which includes an increase in droughts and floods. This impact of droughts and flooding will become more common, causing many problems. Also less fresh water means less agriculture, food and income. Food and agriculture – Agriculture is highly dependent on specific climate conditions. Increases in temperature and carbon dioxide levels can be beneficial for some crops in some places whereas changes in the frequency and severity of droughts and floods could pose challenges for farmers. Climate change will have a significant impact on food availability and food accessibility in many parts of the world. It poses a significant risk of increased crop failure, loss of livestock and will have an impact on food security. This will affect human livelihood and health, also natural plants which grow could also be affected by the changes in climate. These plants may be a main food source for many species. Forests – Forests do everything for us. They purify the air, improve water quality, keep soils intact, provide us with food, wood products and medicines, as well as being home to many wildlife species. It is estimated that 1.6 billion people worldwide depend on forests for their livelihoods, including 60 million people who rely on them for their substances. As well as this they also help protect the planet from climate change by absorbing massive amounts of carbon dioxide. However they’re being destroyed and damaged at an alarming rate by logging and burning to clear land for agriculture and livestock. These activities are releasing huge amounts of carbon dioxide and greenhouse gases into the atmosphere. This problem is so bad that scientists predict 20 percent of global carbon emissions come from deforestation. This is greater then every car, truck and plane emission on the planet combined. Wildlife – Ecosystems are made up of very delicate balances that can easily be interfered with or destroyed. This balance is more delicate at different parts of the world where climates are different, e.g. the Artic has very delicate balances. When something changes everything can collapse and species can decline. This is one main reason why wildlife is declining due to climate change. There are many different ecological impacts which include change in habitats, shifts in timings, range shifts, spreading of pests and diseases, and many more. Species are adapting to temperature rises by increasingly shifting their range towards the cooler poles or higher altitudes. Species that already inhabit the upper limit of their habitat, like polar bears, snow leopards and dotterels, literally have nowhere else to go. Other species include the British comma butterfly which has moved 137 miles northward in the past two decades along with the dartford warbler that has been steadily moving northward in the UK. Seasonal shifts are another impact, examples include migratory birds like whitethroat, reed warbler and song thrush which are arriving earlier and species like the edible dormouse have been emerging from hibernation earlier by an average of eight days per a decade. Species are also being squeezed out. For example the mountain pygmy possum of Australia is being affected by the warmer winters, emerging from hibernation before its prey, the bogong moth, and often starving to death. What’s next for the planet? Here we can go one way or another. We can turn a blind eye to it all and carry on how we are or we can actually take action and take notice. The right way to go is to not ignore it as by doing that we will dig ourselves into a bigger hole and there will be no going back. In some parts of the world it is being taken seriously. If we do decide to carry on the way we’re going temperatures could carry on rising and we would carry on destroying our only planet. A rise of just 2 degrees would mean severe storms and floods, droughts, seas becoming becoming more acidic, coral and krill dying, food chains destroyed, little or no Artic sea ice in Summer which would not only be bad news for the species there but it would also mean that the global climate would warm faster. Beyond 2 degrees and we could start to see rainforests dying, increased melting of the ancient ice sheets, dramatic sea levels rising, all resulting in people and animals suffering along the way. Scientists predict that if we don’t act now in the next century temperatures could rise up to 6 degrees. Whilst doing a bit of research into climate change and Wednesdays rally I found this WWF questionnaire which works out your carbon footprint. I’m a ashamed to say that my result said that if everyone lived like me we’d need 2.3 planets. Now I would of expected it to be a lot lower than this as I do try and do as much as I can. I’m vegan, so don’t eat any animal products, I’ve never travelled anywhere by plane, I tend to use public transport or walk a lot more than just asking my parents for a lift and also I like to think I do my part by making sure I turn lights off etc. To me this shows that even when you do your bit and what you can it is still very difficult. Therefore it’s very important that we lobby, put our point across and try our hardest to show that something needs to be done all around the world to help stop climate change and reduce our Footprint. When you read and hear about the risk and dangers of climate change, in my opinion, you can’t help but feel helpless. A few weeks back I heard about a rally that would be taking part in London where you could lobby MPs. I’ve been on a few rally/protest things recently and I really enjoy going on them therefore I decided to go along. Not only did I go because I enjoy going to things like this but because I wanted to speak up about climate change. 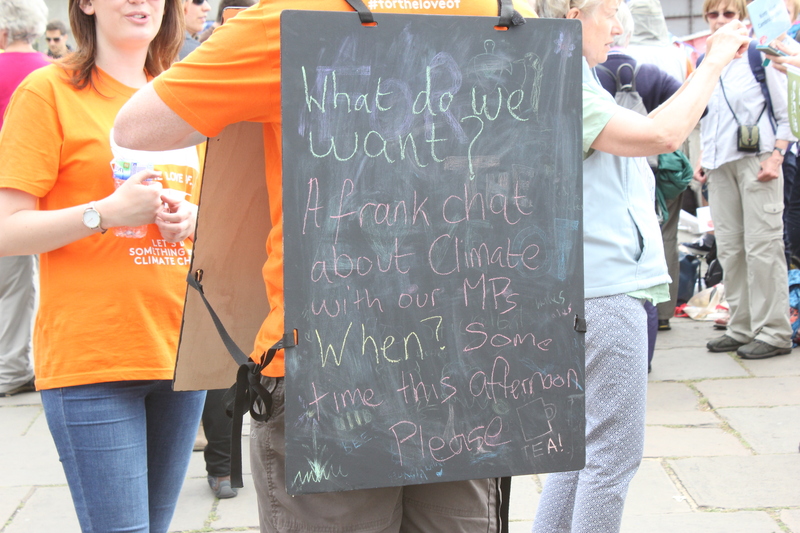 The aim of the rally was for different people who are affected by climate change in different ways to get together and speak up. Instead of going down on the train like I normally do to events like this, I managed to get myself a seat on a coach. This was much different to going on the train and on the way it was really great to speak to other like-minded people about climate change and their different takes on it. For example, even though I stick up for all impacts of climate change my main one is to do with the natural world. Others on the coach had different takes again so it was really interesting to share arguments and thoughts. The coach ride was much more enjoyable then going on the train too as when we stopped off at the Oxford service station, on the M40, there was a red kite flying right above my head! I’ve seen red kites lots of times but never that close so it was pretty amazing! When we got on our way again I saw at least another 6 kites down the M40 which was very exciting and really brightened the journey. Once in London I had a walk around where all the different things were going on before going to find where my constituency was. 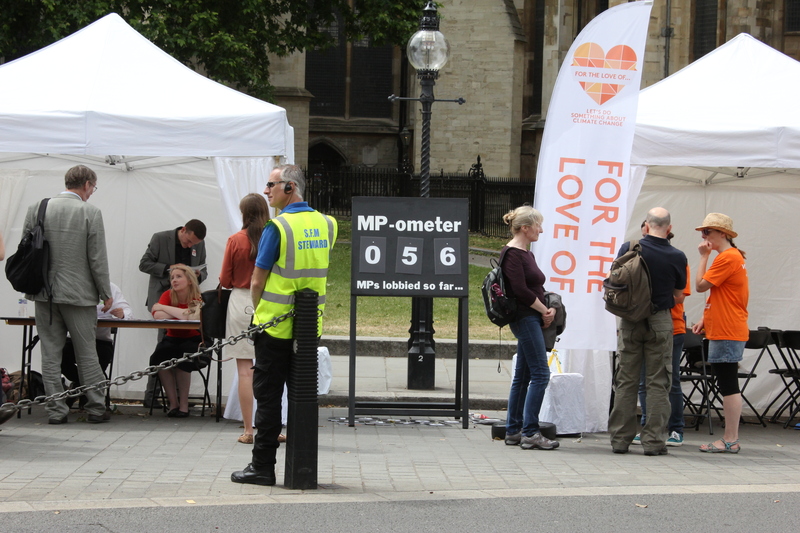 The event was held around Westminster, after all this is where the MPs are. Throughout the day there was different things going on at different places but unfortunately I didn’t have time to go to all of these as I was waiting around for my MP for a while. 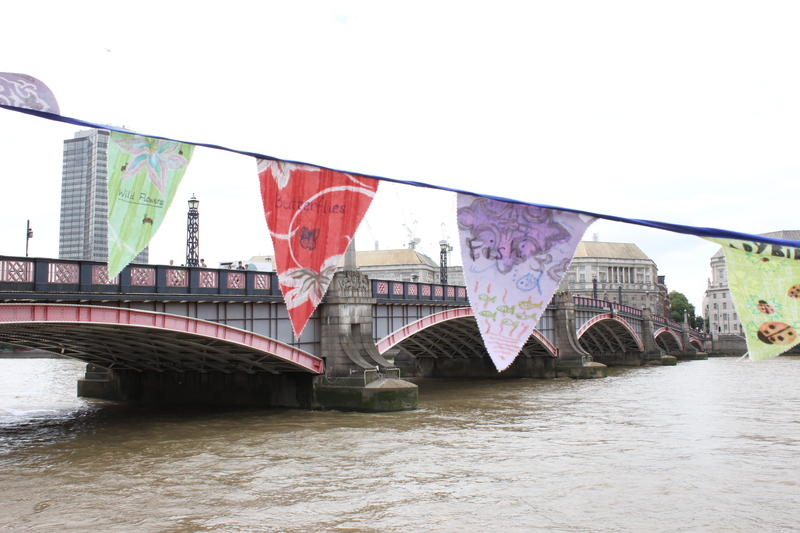 All constituencies were lined up along the Millbank, over the bridge and down the other side opposite Parliament. When I arrived at where my constituency was I met two others from Lichfield who were trying to get hold of the MP for Lichfield, Michael Fabricant. We’d all emailed him as the event approached but he never got back to us. It had said on the website he was coming but not what time. In the end we managed to get hold of his secretary and I sent him a few tweets but we were told he was ‘too busy’. By this point there was a few of us from Lichfield which was really great and I had a good chat with all of them. I also spent a few hours talking to people from constituencies close to Lichfield who were all like-minded people and it was great to share our thoughts and feelings on climate change. By speaking to all these people it really gave me a feel of how passionate people feel about it and how it really does affect everyone. It was also great to meet and have a chat with AFON Creative Director, Lucy McRobert. 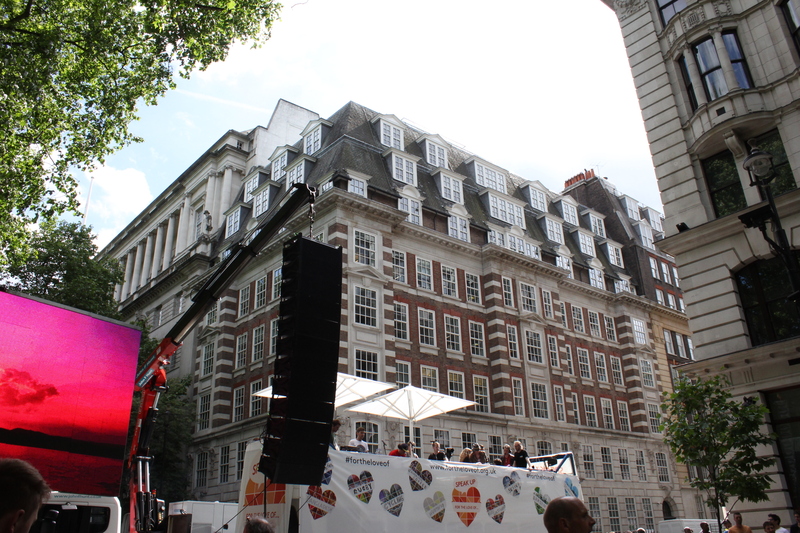 As well as this there were lots of people there from different religions. I’m not a religious person but again it was really interesting to hear their different takes and what they think needs to be done. 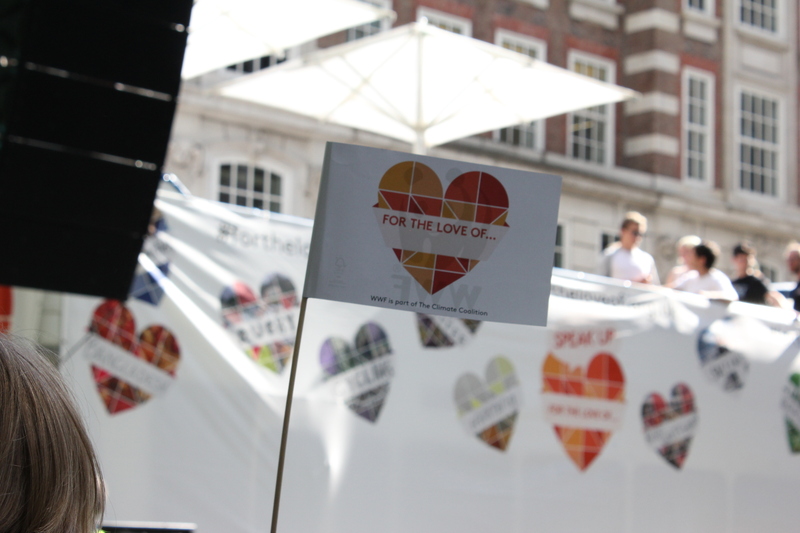 Two main religious organisations which attended the event were CAFOD and Christian Aid. 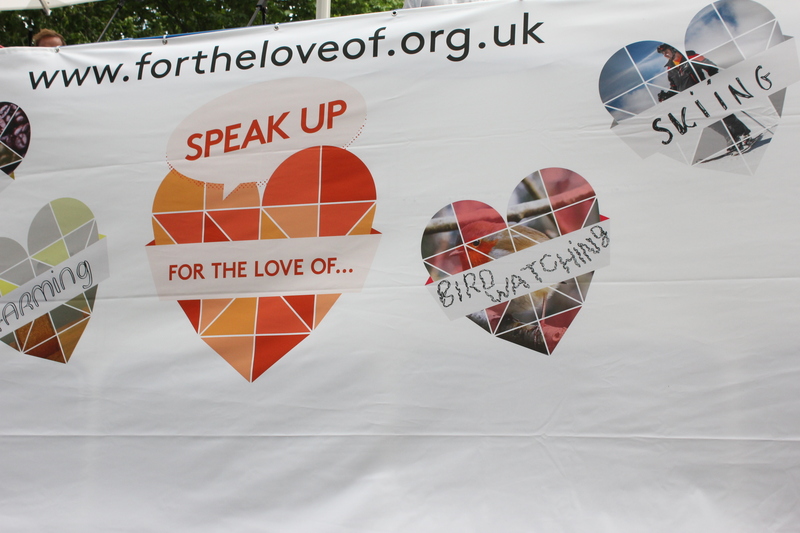 Along with lots of other organisations including the Wildlife Trust, RSPB, WWF, Oxfam, Greenpeace, WI and many more. 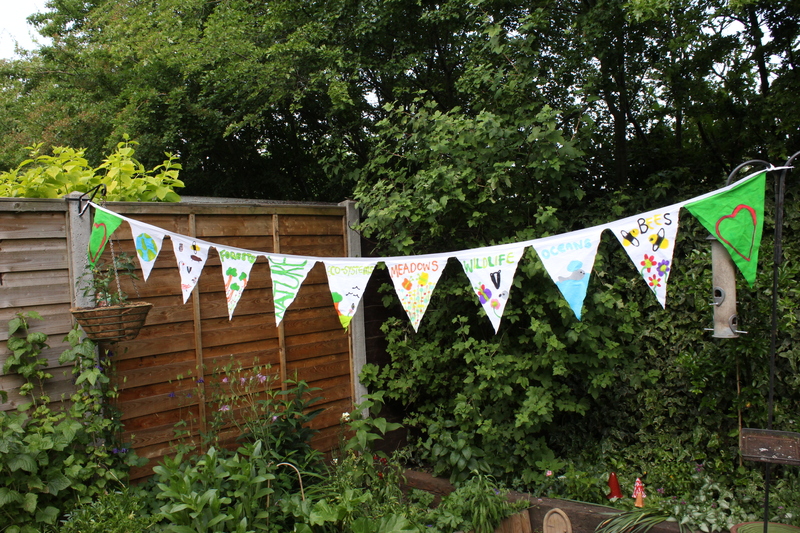 The theme of the day was to make bunting which I spent all day Tuesday doing. I was very pleased with my bunting and I held it up high during the rally. The rally took place at 4.30. 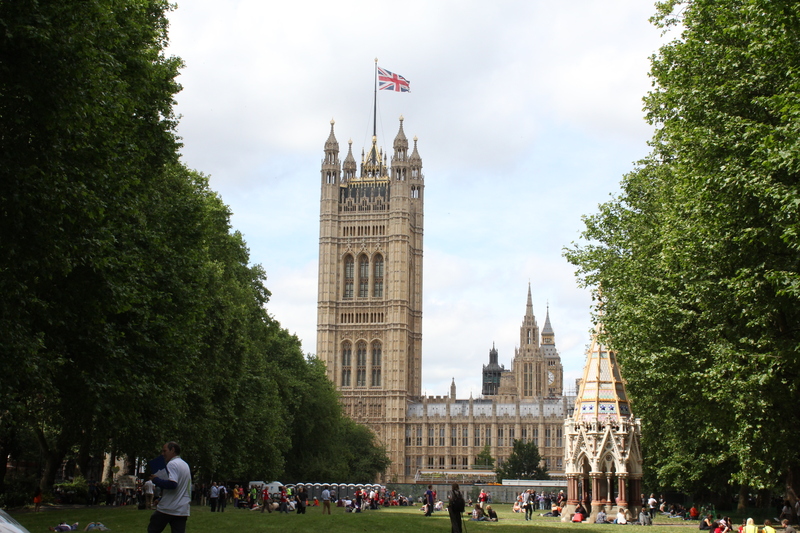 The main ‘stage’,which was an open top double decker bus, was along the Millbank then the crowds of people went all the way down to the Houses of Parliament. The rally was hosted by Arthur Smith and there was a variety of guests. From sportsmen who spoke about how they were affected to young children, farmers, gardeners and many more. There was also three people who spoke from different religious organisations. 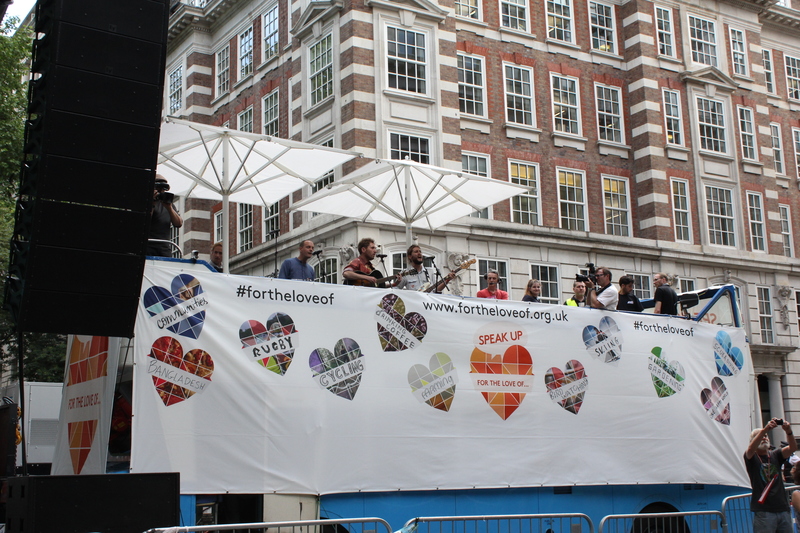 After a fantastic line up of great and inspiration speakers the rally was finished off perfectly with the band Stornoway playing two of their songs. One thing Wednesday showed me was how climate change links to everything and it really is a massive problem that needs to be dealt with. However what worries me is are some of the most powerful people in the world actually going to take it seriously. For example my local MP was ‘too busy’ to meet me, I’m not sure why but how can he be too busy to chat and hear opinions from his constituents one of the worlds biggest problems? Maybe not in there life time or my life time we will see profound affects of climate change but we are seeing definite affects of climate change now and if we don’t act now then it will be too late. Some only care about their life time and not the life of those that are yet to be born or the species which are yet to become extinct. 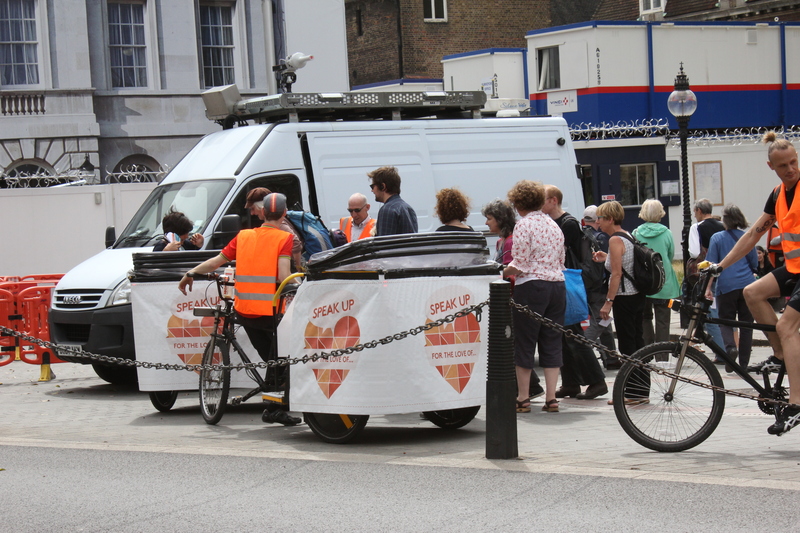 Also one negative point from the day was the lack of media reports as sadly I saw nothing about it on the news. With so many people attending and caring about such a big issue this should have been compulsory. 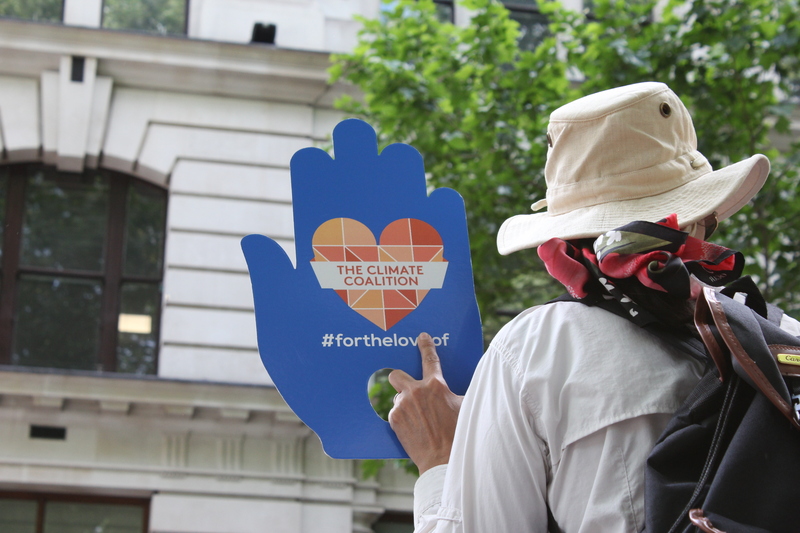 Here’s a link to the ‘For the Love of’ and the Climate Coalition websites where you can find out more and what you can do. It was a really superb day and I was really pleased to be a part of it. 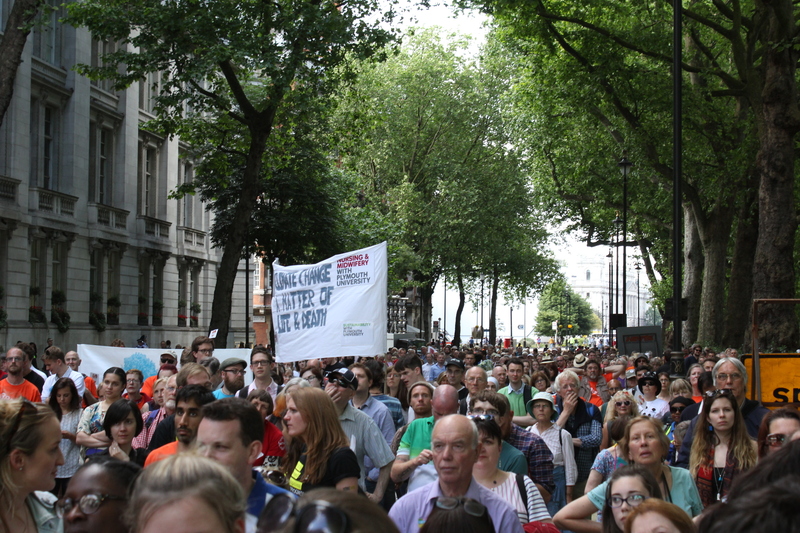 Overall 9,000 people attended and 330 MPs came out and spoke to constituents. Let’s hope some of those MPs took note and take action! It’s vital we stop destroying this amazing planet. Previous PostDay of talking all things wild!Next PostPond dipping fun!